But I can understand why some people want to hide their deviations, and why they want to restrict them to those logged in to DeviantArt. With that in mind, because I know there are many people who do want to use this feature, and newer members may not be aware that it exists, I'm going to show you how to do this, both on new uploads and en masse on pieces already in your gallery. Note: Since journals are now counted as deviations, they are also going to be eligible for this feature. So if you post a journal that you only want logged in members of DeviantArt to see, you can certainly use this feature for that. First, let's look at how to do this with a newly submitted piece. You've uploaded your file, typed your description, added your tags, chosen your category, and you're ready to submit. Rather than clicking the submit button in the upper right, keep scrolling down a bit. You'll see a section that says "Options". Under that are two white buttons that hide drop down menus. "Gallery and Group options" allows you to choose where the piece appears within your gallery as well as immediately submitting it to groups that you administrate. 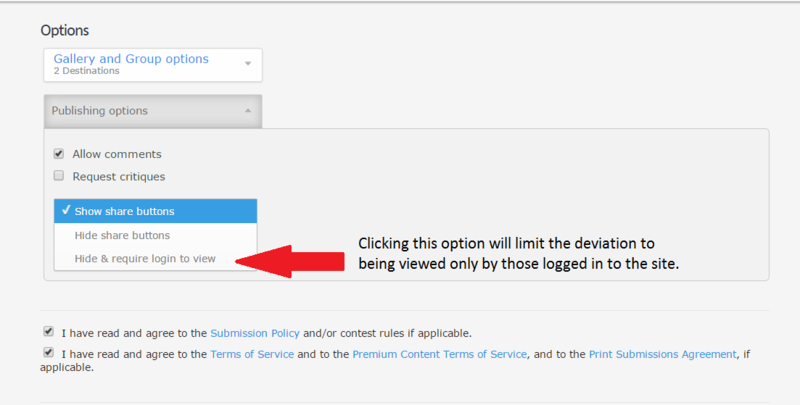 The one we want to look at for the purposes of hiding the deviation's share buttons is "Publishing options"
You have a few choices here, including whether you want to retain full copyright or assign creative commons. But the one which is of interest to us at the moment is "Sharing". This white button is a drop down menu. Its default setting is "Show share buttons", but there are two other options available there. If you're going to hide the share buttons on your deviations, you might consider enabling the "Hide and require login to view" feature. Whether you do or not, you do have the option (if you scroll down a bit further) to remember the settings you choose so that any new uploads will default to the license and sharing settings that you've selected. But what if I want to change this on older uploads now that I know it's there? As you can see in that image, all of the deviations listed on that page of my catalog of postings have share enabled. If you want to change this on all of your deviations, click "All". If you only want a few, then select the ones you want to change. Important: Changes must be made per page, so follow all of the steps below for each page before you move to the next. The drop down menu above the "All, None, Inverse" options holds the actions that you can change from this window. Options for comments and advanced critiques are included in the short list from that drop down. (There are more options available by clicking "More actions..." should you need to access them.) Just below those options you will see the "Sharing" options. 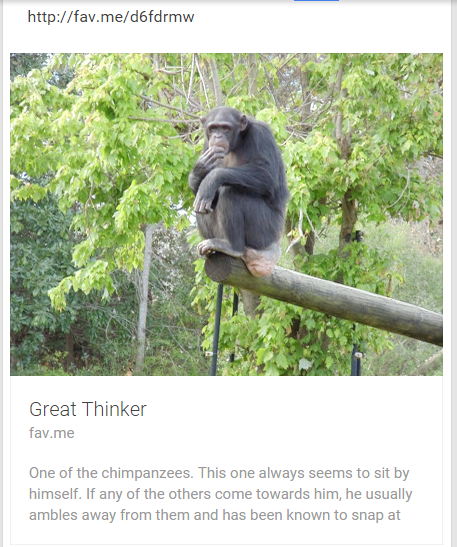 You can see this directly if you are logged out (unless the user changes it ) in this literature feature. So please do bear that in mind when pondering the use of this option. A look at the "show share buttons" drop down and how it works, including the site CEO's explanation of the feature from 2009. Written for projecteducate's Community Week. Thank you so much for making this. :'> I always made the option where as people can't share my stuff, but also reading this journal and the other, I now understand how that can affect my art. Now I'm just wondering about the last option- "Hide and require login to view", if I do that, once someone logs in, won't they still be able to share my artwork?? hey, I really like the deviantart's policy. Even though there are stealings, it is a huge platform and has to balance between liberty and copyrighting. I did a page to display ASCII pixel arts, they are stored in js functions and are extremely easy to steal by anyone. I would then like to know if we could disable users from seeing the code and copy pasting the text. I know it is rough but I really don't want to see the pixel arts I made on some other tumblr page without quoting me. I have "hide and require login to view" set because it stops the Google Images crawler from archiving my photos into Google Images. I'm glad you found it informative - and I agree completely! You're welcome. I'm glad you found it informative. Thanks! You're very correct, to which many say that DA should disable right-click functionality. However, doing so only restricts the abilities of lazy thieves who don't know how to turn off CSS in their browser or don't care to go through the steps to do so. The same is true for written pieces as there are a few users who insist that spyed should implement no-copy. It's a false comfort; FFN implemented it and still thieves will take written works from that site and post them on others. Wattpad has had it implemented for a while and the same is true. for those who have a CORE membership. (I mentioned in a comment that I'm not seeing the same benefits listed, but apparently others do see it listed there...) At any rate, that would be a feature I think many would get behind as it sounds as though it could help to prevent "art theft" (copyright infringement) and give users some protection for their works. I do admit some concern that it only mentions visual art, because that means the bulk of my gallery won't qualify... but it would still be a great step. Though I will say this about the download button: unchecking the box means that they can only steal the resolution of the image you have showing. They aren't going to get the original image size and properties. So that does help with respect to that at least, as there are several artists who will create images in a huge resolution, but their display size is 600 px wide. Sometimes they allow download for 10 (if they're CORE) so they at least know when someone's downloaded their work, which allows viewers to see the better image. But usually when I see that, there's no premium content option, it's just the tiny picture you get to see. So sad, but it is true what you say. The only defense we have is vigilance in protecting our work, which depending on the body of work you produce, can be difficult and time consuming. Unfortunately, too many people put stock into those false deterrents. Perhaps some day, they'll realize it's not as cut and dried as they perceive it to be. This is awesome Thank you for putting this together. Thanks! I'm glad you found it informative. I support the share buttons, but when I first posted pictures here I didn't really understand how that worked. So I hope that by showing what it does and doesn't do, deviants will get a better idea of what the feature actually is because it's not, I don't think, what they presume it is. Now that I know what it is, I'm in favor of the share buttons and they're becoming standard on every site as well. They're an easy way for people to spread a link to your work with credit, so they help increase popularity which many on the site claim is hard to achieve. Still, I'm glad that the article was useful for you! 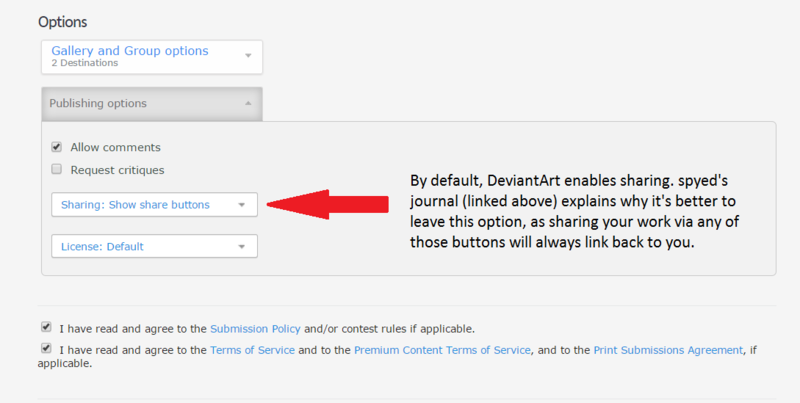 I mean if you are on a website like DeviantArt and the point of it is to share your art with the world, why not able the option and have the possibility to gain more exposure. If you've ever read through the comments on the site update journals posted by ikazon, then you've seen that comment repeatedly. My first month of premium membership was won by chance. My current membership is the result of participation in fella contests, so I can definitely say that there are numerous opportunities available to obtain one. But premium memberships aren't the only things that DeviantArt contests have to offer as prizes. Some offer features, some offer points, some even offer art prizes. Free commissions and prints are excellent, but the question is how do you find out about these contests? So you typed "contest" in the search bar... and you were completely daunted by what was returned. How do you narrow this down? While this is an obvious bug that you hope would be noticed quickly, how can you be sure? Well, one way is to check the status forum. If you don't see the issue you're having listed, then you'll want to file a bug report. for example, it's best to notify the staff of the issue through the official channels. Many people are noting bug issues on the site update journals, but did you know that's not actually how or where they're supposed to be filed? On Reporting SpambotsUPDATED: 27 August 2017 - DA has updated the "Report" option on deviations so that this can now be done without having to file a help desk ticket. It's annoying when they leave spam comments on our works too. And sometimes they even go so far as to send us notes, directing us to try this or that app and "we'll feature your art if you do", naming a group that they have nothing to do with. I've blacked out data personal to my account. DD Suggester: @dragonflyandromedaLast Friday, I featured iingo, the most prolific suggester in LiliWrites DD Suggestion drive. 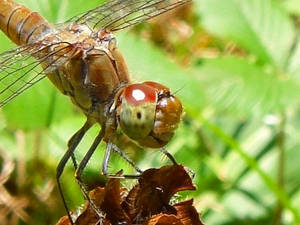 This week, DragonflyAndromeda is in the spotlight. She suggested an astounding 193 individuals to the CVs for DD features, which definitely shows a great deal of dedication to getting art here on DA viewed by as many people as possible! She is also a photographer, specializing in Macro photography with a love of water. Some people like llamas. Some people don't. This article is written for those who'd rather avoid them. You logged into your DeviantArt account, and something wonderful had happened. Twenty-seven activity / reply / comment messages?! You're so excited to see what comments people have left you, that you immediately click on it. When the next screen loads, you find yourself slightly disappointed. You go to your profile and add a line in one of your widgets. "Please don't llama me." We all become accustomed to certain things, especially the interfaces we're using when we access the site. You might remember former views of the site, and if you're feeling nostalgic, you can always take a look through the Timeline to see them again. While there are many user scripts available on the site that can help to return the site interface to something you're more comfortable with, you might be interested to know that DA actually has something offered as a feature to everyone that allows you to modify your personal browsing experience to some degree. It's true that we express ourselves through our art. Some do it through painting, some through verse, and some through another ancient art - sculpture. Sculpture has had a place in society since the time of the ancient Greeks and Egyptians. It has helped us to understand the importance of historical events, and helped archaeologists map the movement and change of cultures over time. As per :faq61:, The Daily Deviation is a daily feature chosen from galleries here on deviantART. Hi my name is GeorgeXVII and in this article i want to help you with some advice and suggestions for earning, buying, or WINNING DeviantArt points. But first i want to familiarize you with what points are! Points (sometimes seen as ) were created by DeviantArt as another way to buy Core Memberships, commissions, give as gifts, or donate to other deviants. How to Buy DA Points. 1.Click on SHOP option in the top menu bar. 2.You will see the Points section at the top along with your current Points balance. If you don't have points the Balance will show 0 points. Oh boy, isn't that a question. This is the starting point of everything. No matter what is going on, if you have pressing matters you need to attend to and you haven't yet, they're always there - chewing your shoulder, nagging at you. You know you should get that done, but "oh really it can wait until tomorrow", "I'm tired now", "maybe later, there's still time". There are some essentials you are going to want to keep in mind when you make your tutorial. Don't forget, great design IS ART! You are new to dA, you enjoy every little drop of attention. You thank everyone for every llama and every favorite. You respond to every comment at length, you return smileys and you comment on all the artwork that your watchers post. After two weeks you have already joined a couple of groups and you enjoy receiving more art you are interested in from different people in your message-center. You also take part in some contests and you get updated every now and again. Then there is a weekend - you are for some reason absent. On monday you take your time to come back to work, and in the evening you want to relax, looking at some nice art on dA - BUT - when you open your profile, you already see that you got several hundreds of messages in your inbox . Pinterest has a reputation for being the site for mommy-and-me projects and crafty DIY adventures. For the artist, however, Pinterest is a trove of resources and inspiration if you know where to look. Here are 5 of the main things I use pinterest for. I hope they bring you some "pinspiration" of your own. Use ctrl-click to open the links in another window and save the tab for later! All art featured is from your fellow deviants! If you're like me, when it comes to art you're always looking to learn new tricks! These three boards have a wide selection of tutorials and instructions for a wide range of materials! This will be a straightforward article that lists some basic literary terms (in alphabetical order) that can be found in, well, literary works. You could use some of these terms to write a spectacular poem or prose piece about cake. Before we get started, head on over to this other PE article that lists a BUNCH of Poetry Terms and Techniques. An item of soft, sweet food made from a mixture of flour, shortening, eggs, sugar, and other ingredients, baked and often decorated. Also known as the first half of my otp. A narrative that has multiple layers of meanings. Allegories are written in the form of fables, parables, poems, stories, and almost any other style or genre. The main purpose of an allegory is to tell a story that has characters, a setting, as well as other types of symbols, that have both literal and figurative meanings.